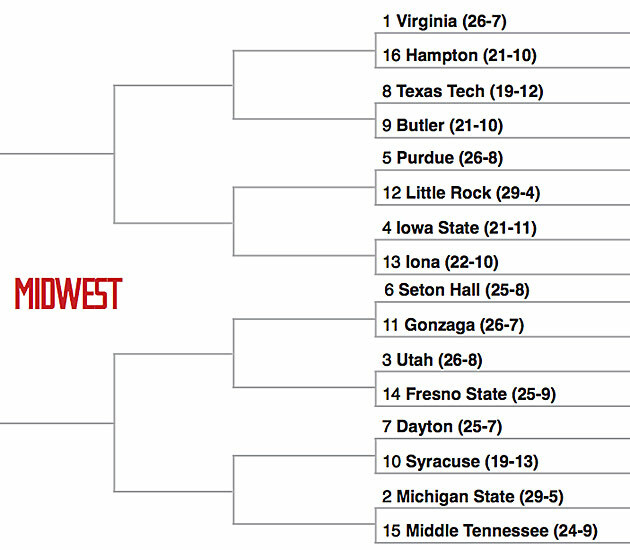 NCAA tournament: Can Virginia get over hump, emerge from Midwest? Can Virginia make it out of the Midwest region in this year’s NCAA tournament? Despite losing in the ACC tournament final, it’s difficult to argue with the overall health of Virginia. UVa entered the game on a five-game wining streak and the committee thought enough of the Cavaliers to give them a No. 1 seed despite seven losses. Since Jan. 19, UVa’s only defeats have come to UNC, Duke and Miami. The Wahoos have recaptured their identity as the grinding and defensively menacing team that has defined Tony Bennett’s tenure there. Virginia is led by Malcolm Brogdon, the ACC player of the year and defensive player of the year. He’s a pantheon great at Virginia, too good to read too much into his 6-for-22 shooting performance against North Carolina on Saturday night. Ultimately, the case for UVa begins and ends with the fact that its offense is ranked No. 9 in efficiency and its defense is No. 4 in KenPom’s ratings. That high-level combo is rare on both sides of the ball. We know, we know. This isn’t much of an upset. But expect this one to happen based on big-game experience. The Bulldogs looked awful in the Big East tournament, getting shellacked by Providence, 74–60. But Butler stars Kellen Dunham (16.3 points per game) and Roosevelt Jones (14.0) have been on the big stage, including winning a game in the NCAAs last year against Texas. The Red Raiders are a sophomore-heavy team that’s overachieved and could be overwhelmed by the moment. In a coin flip game, bet on Dunham’s experience and Jones’s grit to carry Butler. NCAA tournament: Can UNC make its way through a difficult East? Few players had better conference tournament weeks than Seton Hall’s Isaiah Whitehead. He played all week with a composed and focused scowl, drilling pull-up jumpers and step-back three-pointers as Seton Hall rocked Madison Square Garden. The Pirates won their first Big East tournament since 1993. Whitehead finished with 26 points in the upset of No. 3 seed Villanova in the final, including the old-fashioned three-point play in the waning seconds that proved the game-winner. The Hall starts five sophomores and appeared to grow up in New York. The Pirates also have a sniper off the bench, senior Derrick Gordon, who brought a blur of shooting, energy and defense. Few teams in college basketball are hotter than Seton Hall, which has lost just twice since Jan. 27. (both to Butler). Don’t be surprised if that continues. • West preview: Can No. 1 Oregon ride momentum to the Final Four? Utah’s seven-foot Austrian sophomore Jakob Poeltl has blossomed into one of the country’s elite big men and a potential top-10 pick in the upcoming NBA draft. Poeltl is coming off a Pac-12 tournament performance that included 29 points and 11 rebounds in an overtime victory over Cal. He’s averaging 17.6 points and 9.0 rebounds per game, and his diverse post skill set makes him a difficult matchup in modern college basketball. Teams simply don’t have the quality and depth of post players to contend with a post player like Poeltl. In a era where the center is considered a relic, he could be a matchup nightmare.